I totally love these jars from Jonathan Adler. The Uppers, Downers and Dolls jars have been around for a while, but the new Barbie inspired canisters labeled with Glitter and Eyelashes are totally new and totally fabulous. Anyone that knows me, knows that the glitter canister is beyond perfect for me. 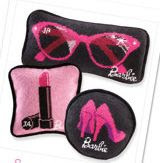 Adler has some other fantastic Barbie merchandise as well, including some darling needlepoint pillows and personal accessories. Hey Sophia-I've been reading your blog for a long while now. It was recommended to me by my friend, Danielle who writes Culturistas and I always enjoy your postings. This is such a fun idea!!! My personal style in three words: adventurous, unique, flexible-fibers. Looking forward to hearing from you. Yay for dressing up! I love those Barbie pillows. I've always been amused by these but I'm VERY amused by the new Barbie ones. GLITTER! I heart Jonathan Adler, too! I'm so happy to have found your blog.